#2-12 Classic Brunswick pool table from the 1920s. 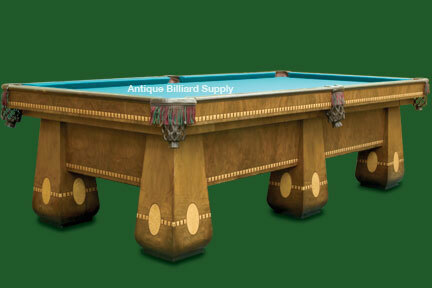 This antique pool table model is said to be one of the best playing tables of all time. Walnut burl with extensive inlay of bird's-eye maple and other woods. Extra-thick slate. Nine-foot size. Restored and available for sale.